The theme for this month is Brunch Ideas for Kids. We have pretty late morning during weekend, and my lil ones wake up with "Amma i m hungry" from their mouth. It will be pretty tough to make them brush first, before they eat something. I m sure, many house-holds have the same issue during weekends and worse during holidays. Since it is already late for breakfast and pretty early for lunch, i usually make something heavy that balances both. Why not, make a list of what we make, so it is easy for other mommies who look for ideas. So,ladies put on your thinking hat and send me some yummilicious brunch recipes. I have listed the rules below and one lucky winner will be taking away a surprise cookbook from my kitchen. Cook, fry, saute, bake or blend any Vegetarian Dish that fits the theme Brunch Ideas for Kids. Since this is a Vegetarian blog, i cannot accept meat entries. However, Eggs are allowed in a Baked Dish. The dish prepared should be accepted by your own kid, kid from your family or friends. Or even something that you loved eating as a kid. Entries need to be posted in your blog between 15th April 2016 and 15th May 2016. 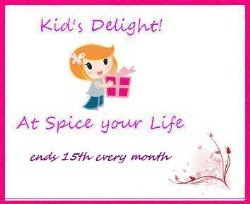 Kindly link up this event announcement(this post link) and Valli’s Kid’s delight announcement. Bloggers kindly link your entries in the linky tool below. Non-bloggers are also invited to participate, kindly send in your entries along with the picture to enveetukitchen@gmail.com. Thanks Priya..I so looking forward for some exciting ideas..